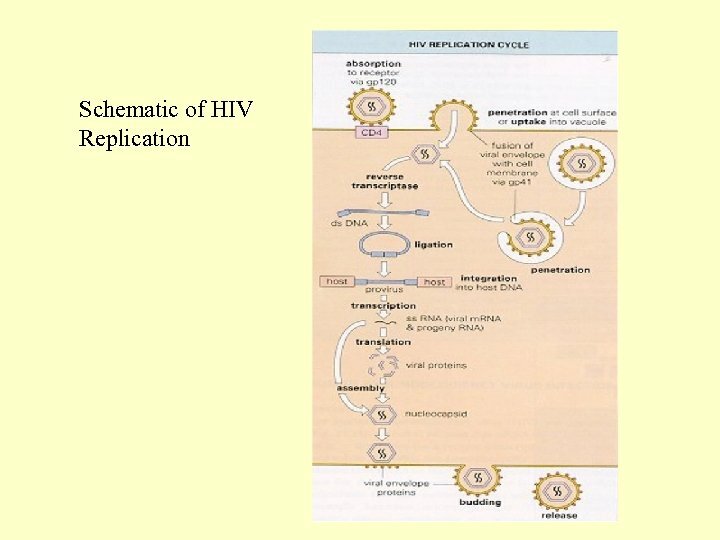 Replication n The first step of infection is the binding of gp 120 to the CD 4 receptor of the cell, which is followed by penetration and uncoating. The RNA genome is then reverse transcribed into a DNA provirus which is integrated into the cell genome. This is followed by the synthesis and maturation of virus progeny. 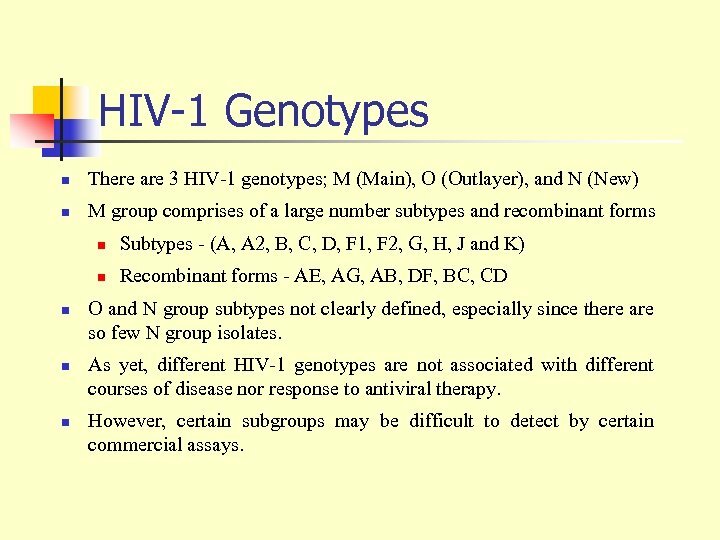 HIV-1 Genotypes n There are 3 HIV-1 genotypes; M (Main), O (Outlayer), and N (New) n M group comprises of a large number subtypes and recombinant forms n n n Subtypes - (A, A 2, B, C, D, F 1, F 2, G, H, J and K) Recombinant forms - AE, AG, AB, DF, BC, CD O and N group subtypes not clearly defined, especially since there are so few N group isolates. As yet, different HIV-1 genotypes are not associated with different courses of disease nor response to antiviral therapy. However, certain subgroups may be difficult to detect by certain commercial assays. Clinical Features 1. Seroconversion illness - seen in 10% of individuals a few weeks after exposure and coincides with seroconversion. Presents with an infectious mononucleosis like illness. 2. Incubation period - this is the period when the patient is completely asymptomatic and may vary from a few months to a more than 10 years. The median incubation period is 8 -10 years. 3. 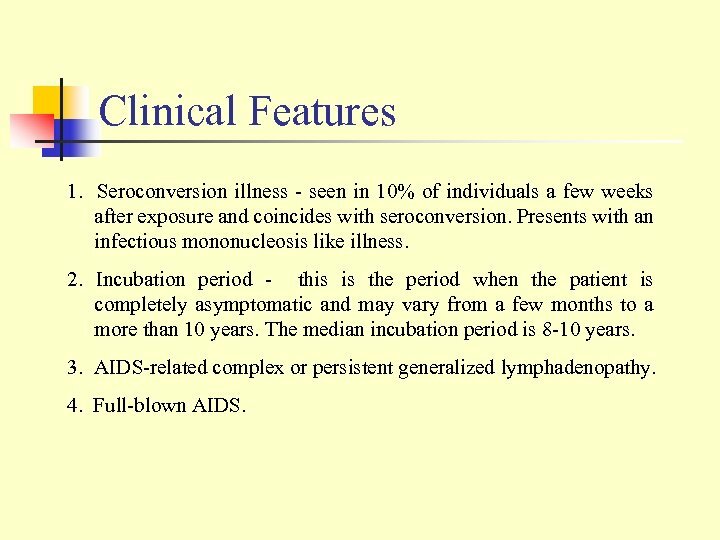 AIDS-related complex or persistent generalized lymphadenopathy. 4. Full-blown AIDS. 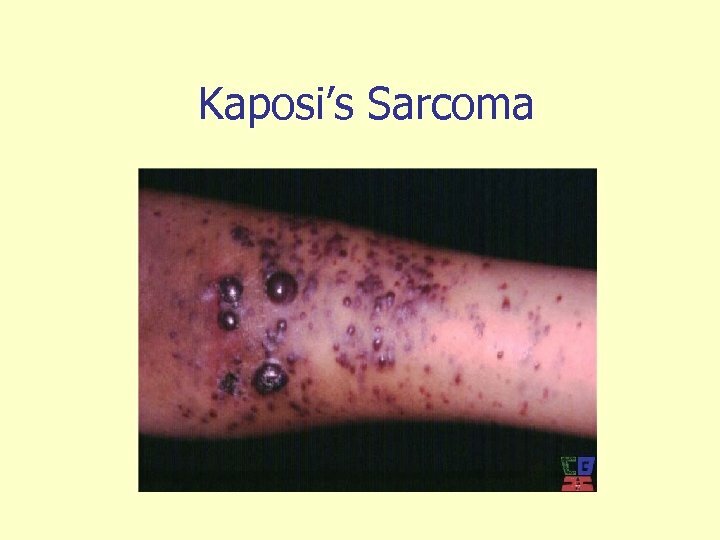 Opportunistic Tumours n n n The most frequent opportunistic tumour, Kaposi's sarcoma, is observed in 20% of patients with AIDS. KS is observed mostly in homosexuals and its relative incidence is declining. 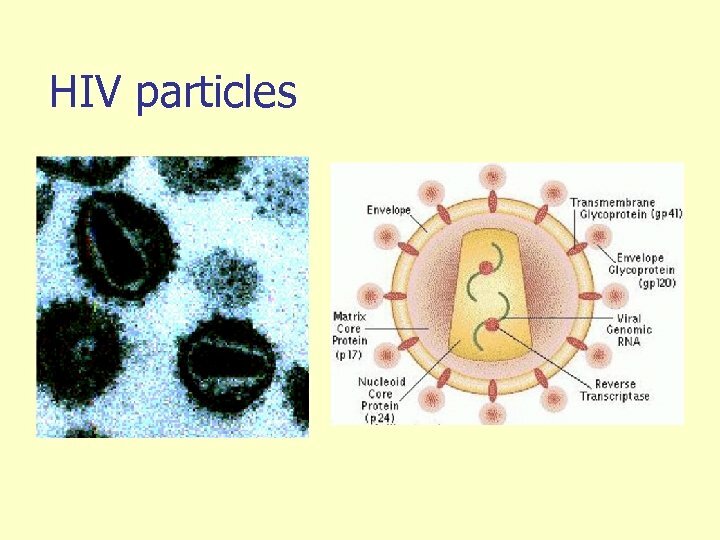 It is now associated with a human herpes virus 8 (HHV-8). Malignant lymphomas are also frequently seen in AIDS patients. 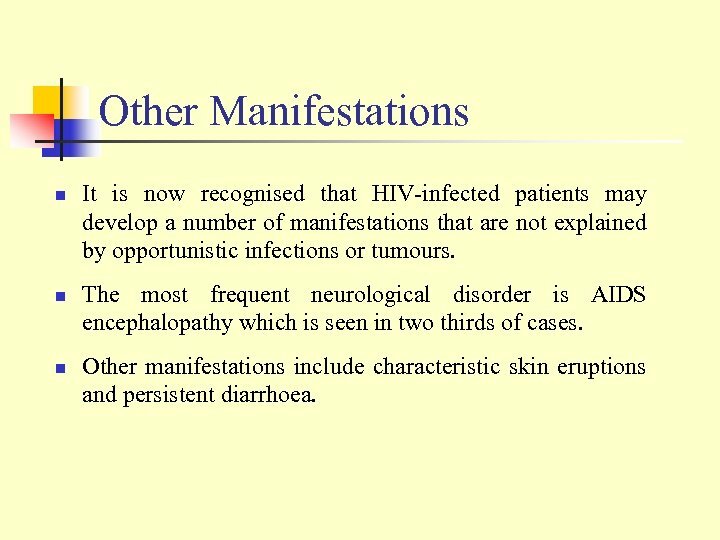 Other Manifestations n n n It is now recognised that HIV-infected patients may develop a number of manifestations that are not explained by opportunistic infections or tumours. The most frequent neurological disorder is AIDS encephalopathy which is seen in two thirds of cases. 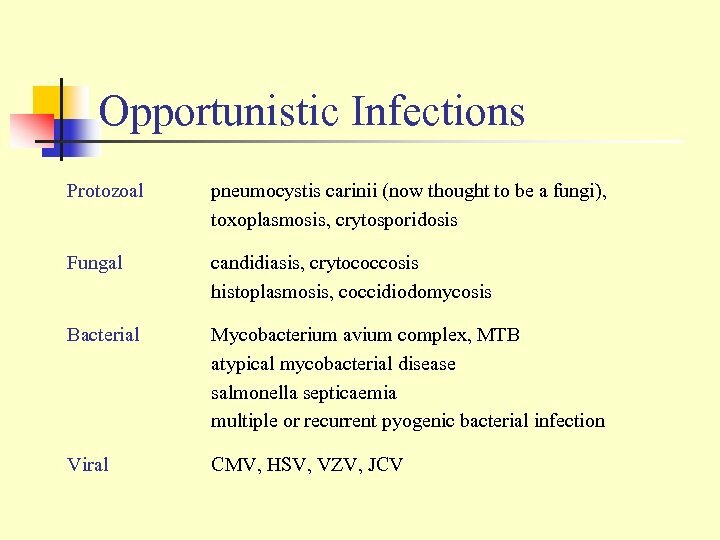 Other manifestations include characteristic skin eruptions and persistent diarrhoea. Epidemiology 1. Sexual transmission - male homosexuals and constitute the largest risk group in N. America and Western Europe. In developing countries, heterosexual spread constitute the most important means of transmission. 2. Blood/blood products - IV drug abusers represent the second largest AIDS patient groups in the US and Europe. Haemophiliacs were one of the first risk groups to be identified: they were infected through contaminated factor VIII. 3. Vertical transmission - the transmission rate from mother to the newborn varies from around 15% in Western Europe to up to 50% in Africa. Vertical transmission may occur transplacentally route, perinatally during the birth process, or postnatally through breast milk. 4. In 2003, an estimated 4. 8 million people (range: 4. 2– 6. 3 million) became newly infected with HIV. This is more than in any one year before. Today, some 37. 8 million people (range: 34. 6– 42. 3 million) are living with HIV, which killed 2. 9 million (range: 2. 6– 3. 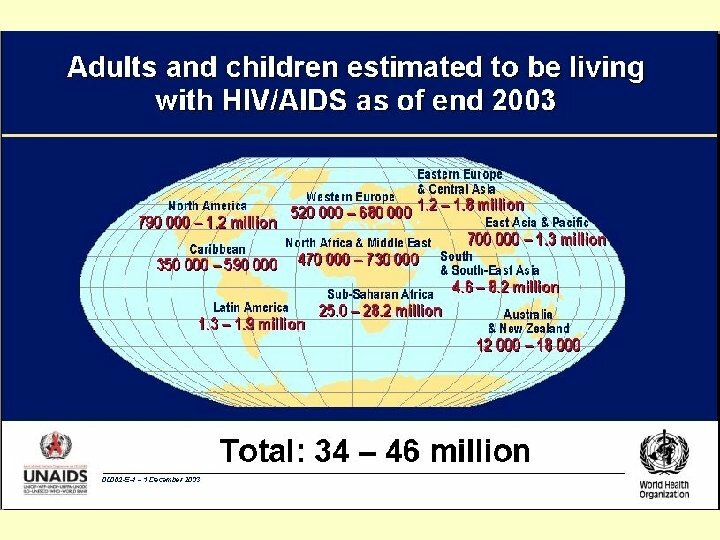 3 million) in 2003, and over 20 million since the first cases of AIDS were identified in 1981. 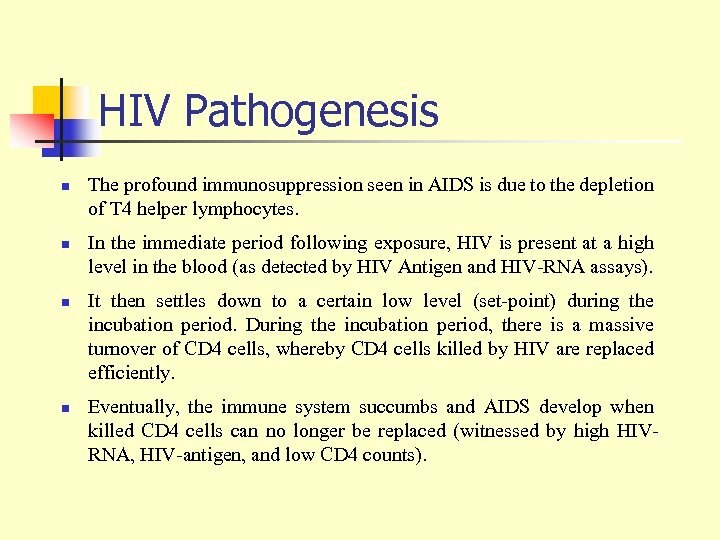 HIV Pathogenesis n n The profound immunosuppression seen in AIDS is due to the depletion of T 4 helper lymphocytes. In the immediate period following exposure, HIV is present at a high level in the blood (as detected by HIV Antigen and HIV-RNA assays). It then settles down to a certain low level (set-point) during the incubation period. 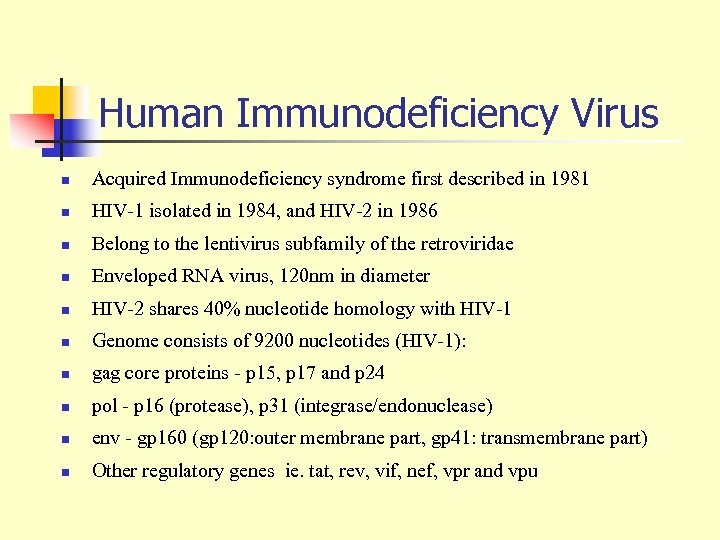 During the incubation period, there is a massive turnover of CD 4 cells, whereby CD 4 cells killed by HIV are replaced efficiently. 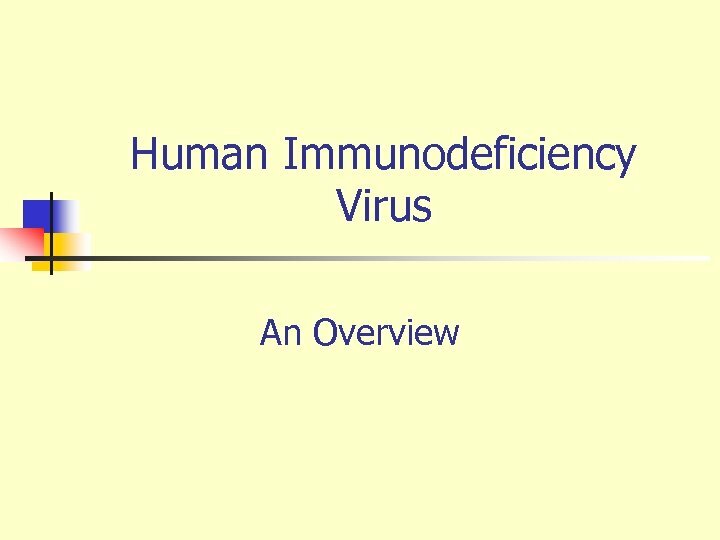 Eventually, the immune system succumbs and AIDS develop when killed CD 4 cells can no longer be replaced (witnessed by high HIVRNA, HIV-antigen, and low CD 4 counts). 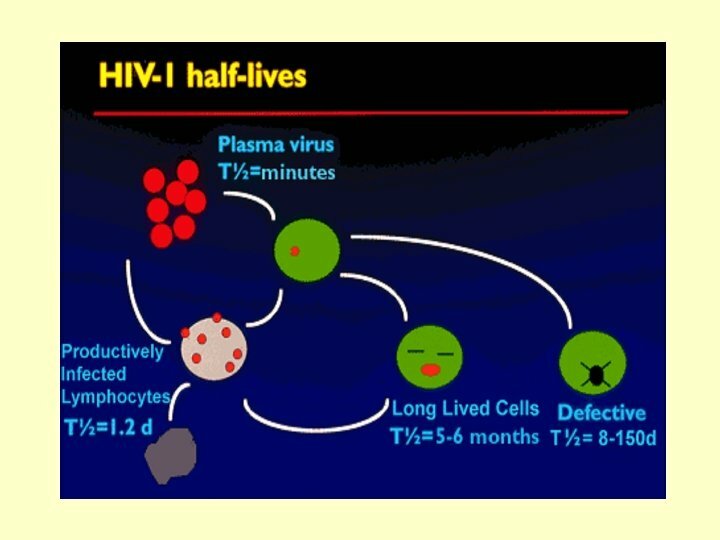 HIV half-lives n n n Activated cells that become infected with HIV produce virus immediately and die within one to two days. Production of virus by short-lived, activated cells accounts for the vast majority of virus present in the plasma. 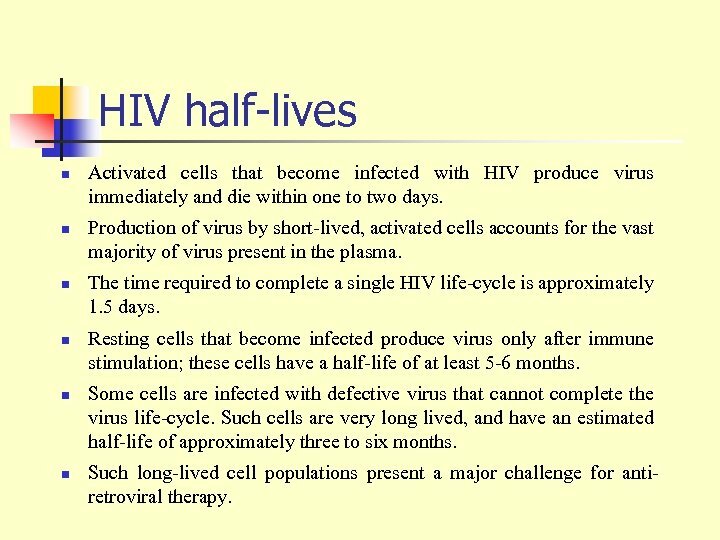 The time required to complete a single HIV life-cycle is approximately 1. 5 days. Resting cells that become infected produce virus only after immune stimulation; these cells have a half-life of at least 5 -6 months. Some cells are infected with defective virus that cannot complete the virus life-cycle. Such cells are very long lived, and have an estimated half-life of approximately three to six months. Such long-lived cell populations present a major challenge for antiretroviral therapy. 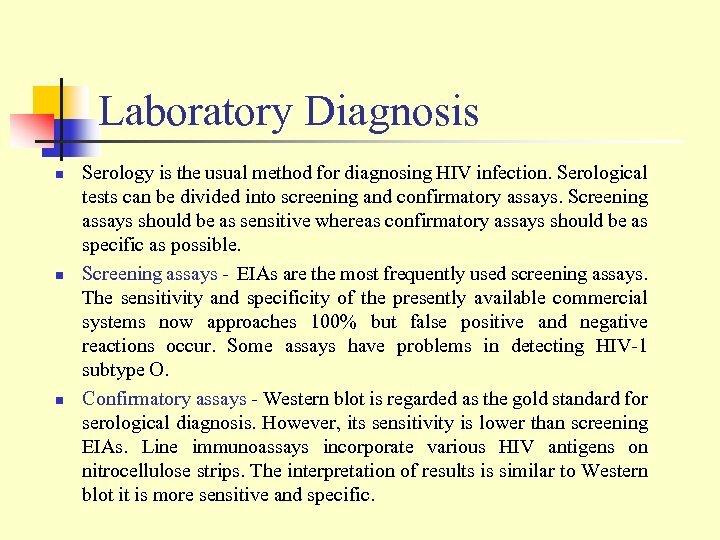 Laboratory Diagnosis n n n Serology is the usual method for diagnosing HIV infection. Serological tests can be divided into screening and confirmatory assays. Screening assays should be as sensitive whereas confirmatory assays should be as specific as possible. 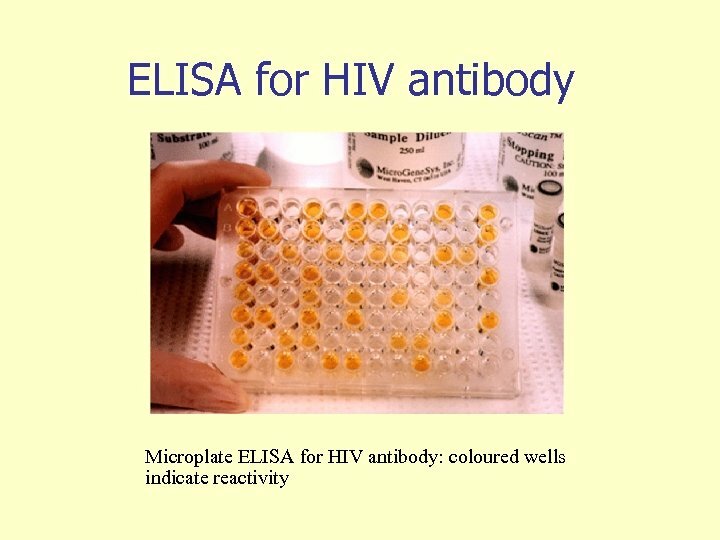 Screening assays - EIAs are the most frequently used screening assays. The sensitivity and specificity of the presently available commercial systems now approaches 100% but false positive and negative reactions occur. 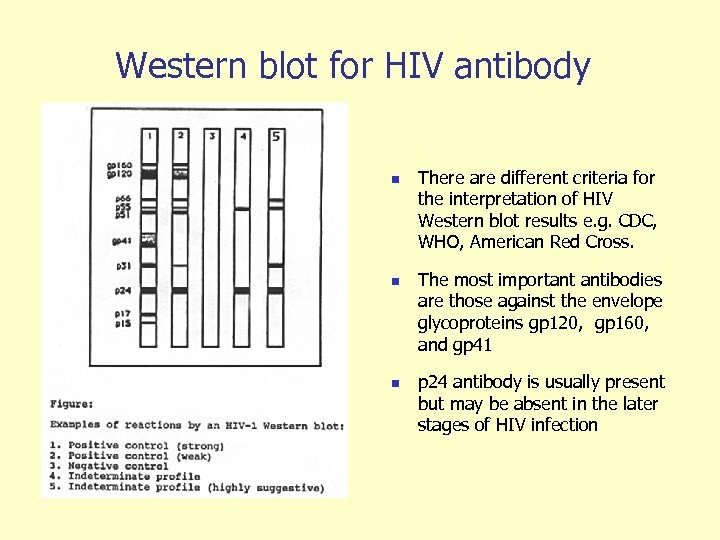 Some assays have problems in detecting HIV-1 subtype O. Confirmatory assays - Western blot is regarded as the gold standard for serological diagnosis. However, its sensitivity is lower than screening EIAs. Line immunoassays incorporate various HIV antigens on nitrocellulose strips. The interpretation of results is similar to Western blot it is more sensitive and specific. 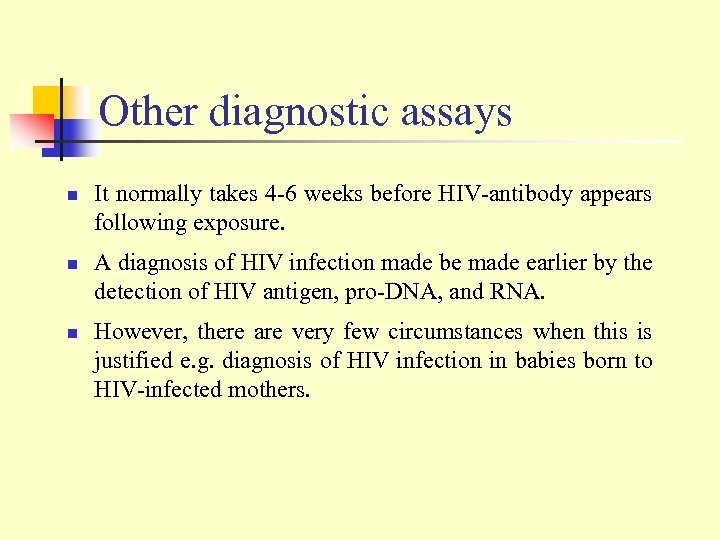 Other diagnostic assays n n n It normally takes 4 -6 weeks before HIV-antibody appears following exposure. 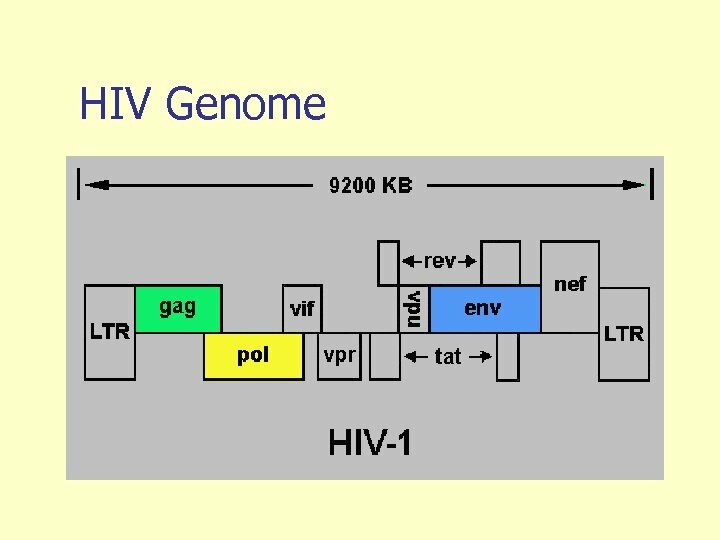 A diagnosis of HIV infection made be made earlier by the detection of HIV antigen, pro-DNA, and RNA. However, there are very few circumstances when this is justified e. g. diagnosis of HIV infection in babies born to HIV-infected mothers. 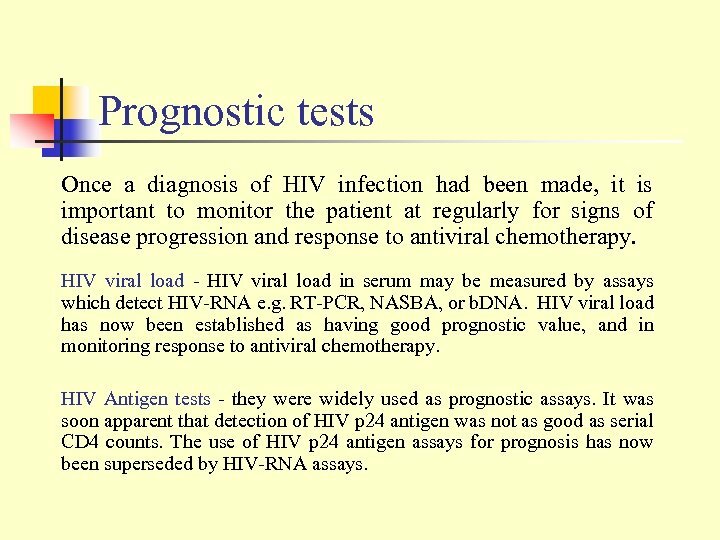 Prognostic tests Once a diagnosis of HIV infection had been made, it is important to monitor the patient at regularly for signs of disease progression and response to antiviral chemotherapy. 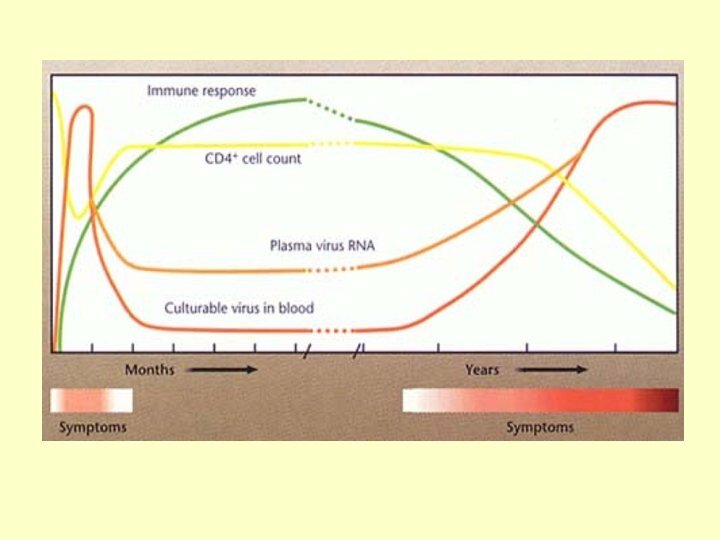 HIV viral load - HIV viral load in serum may be measured by assays which detect HIV-RNA e. g. RT-PCR, NASBA, or b. DNA. HIV viral load has now been established as having good prognostic value, and in monitoring response to antiviral chemotherapy. HIV Antigen tests - they were widely used as prognostic assays. It was soon apparent that detection of HIV p 24 antigen was not as good as serial CD 4 counts. The use of HIV p 24 antigen assays for prognosis has now been superseded by HIV-RNA assays. 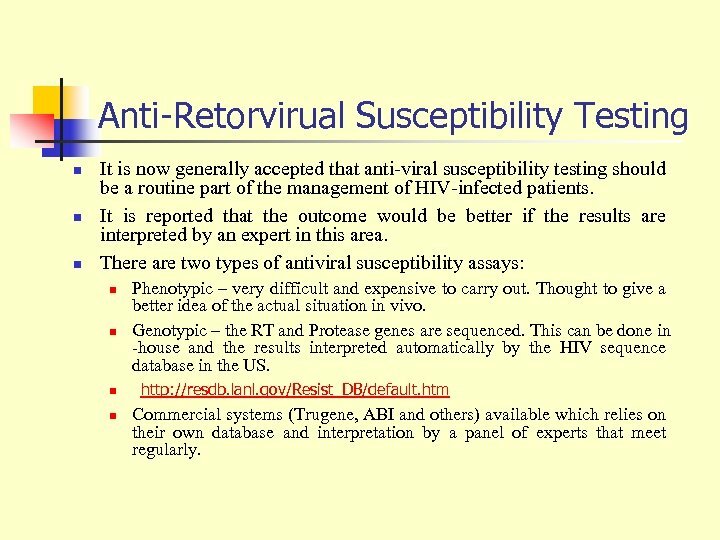 Anti-Retorvirual Susceptibility Testing n n n It is now generally accepted that anti-viral susceptibility testing should be a routine part of the management of HIV-infected patients. It is reported that the outcome would be better if the results are interpreted by an expert in this area. There are two types of antiviral susceptibility assays: n n Phenotypic – very difficult and expensive to carry out. Thought to give a better idea of the actual situation in vivo. 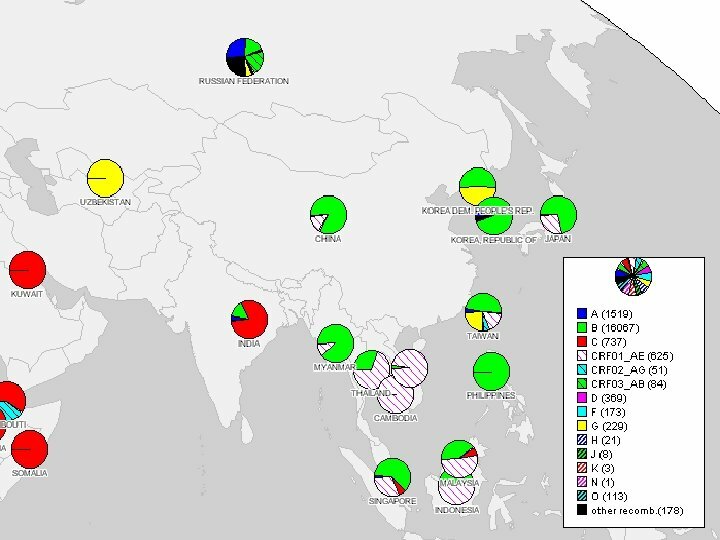 Genotypic – the RT and Protease genes are sequenced. This can be done in -house and the results interpreted automatically by the HIV sequence database in the US. http: //resdb. lanl. gov/Resist_DB/default. htm Commercial systems (Trugene, ABI and others) available which relies on their own database and interpretation by a panel of experts that meet regularly. Treatment n n The speed of advance in the area of treatment of HIV is unprecedented in the history of medicine and is one of the greatest successes. A successfully treated person should have the same life-expectancy as an uninfected person. 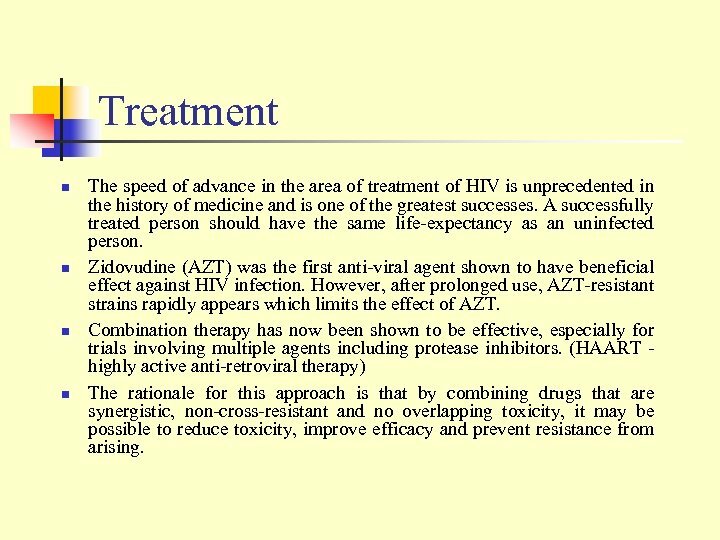 Zidovudine (AZT) was the first anti-viral agent shown to have beneficial effect against HIV infection. However, after prolonged use, AZT-resistant strains rapidly appears which limits the effect of AZT. Combination therapy has now been shown to be effective, especially for trials involving multiple agents including protease inhibitors. 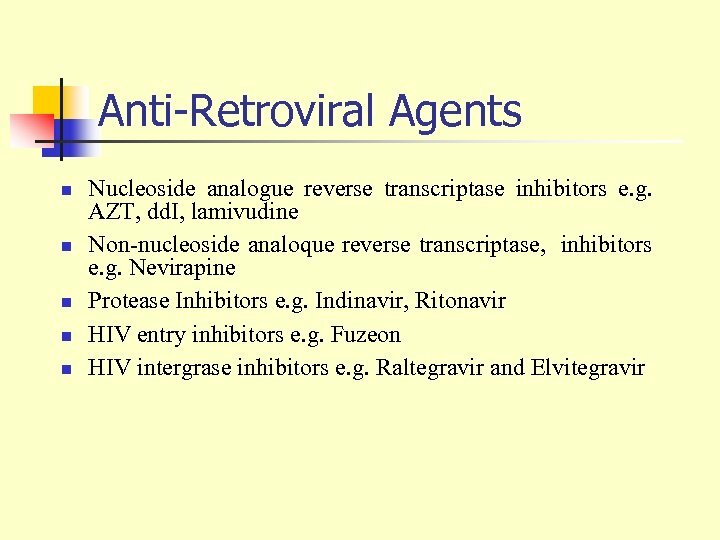 (HAART highly active anti-retroviral therapy) The rationale for this approach is that by combining drugs that are synergistic, non-cross-resistant and no overlapping toxicity, it may be possible to reduce toxicity, improve efficacy and prevent resistance from arising. Prevention n n The risk of contracting HIV increases with the number of sexual partners. A change in the lifestyle would obviously reduce the risk. 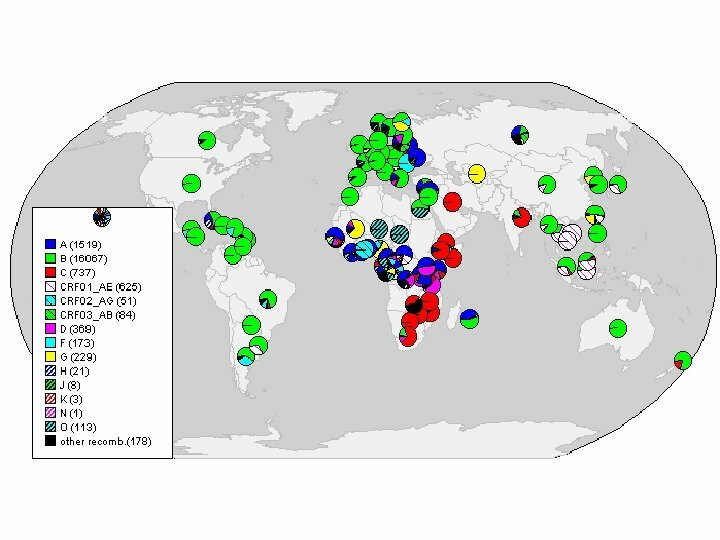 The spread of HIV through blood transfusion and blood products had virtually been eliminated since the introduction of blood donor screening in many countries. AZT had been shown to be effective in preventing transmission of HIV from the mother to the fetus. The incidence of HIV infection in the baby was reduced by two-thirds. The management of health care workers exposed to HIV through inoculation accidents is controversial. Anti-viral prophylaxis had been shown to be of some benefit but it is uncertain what is the optimal regimen. Vaccines are being developed at present but progress is hampered by the high variability of HIV. Since 1987, more than 30 HIV candidate vaccines have been tested in approximately 60 Phase I/II trails, involving more than 10, 000 healthy volunteers. A phase III trial involving a recombinant gp 120 of HIV subtype B was reported in Feb 2005 to be ineffective in preventing HIV infection.